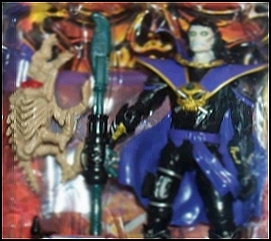 They were made to be the next super-line, a He-Man for the 90's, but they became one of the great action figure tragedies. In 1994, Playmates Toys wanted a new line that would be as popular as the Ninja Turtles, who were currently suffering a decline in popularity. The result would be a story about a legion of good guys going after a bunch of evil, living skeletons on the planet Luminaire, a sort of medieval fantasy meets sci-fi. According to the story, the evil Baron Dark tries to steal the powerful Lightstar Crystal by tricking the youngest brother of the royal family, who kept it safe, to get it for him . The Baron then split the stone and took the evil half, which caused him, and all who were evil at heart, to become living skeletons. It was then that he formed his Skeleton Legion, whose goal was to steal the other half of the crystal and then conquer the peaceful world of the Luminaries. The good-hearted Royal Family is determined to make sure Baron Dark never gets the other half of the crystal, and the battle of light and dark begins. The good guys, The Legion of Light, were known as the Steele siblings consisting of Justin (Prince Lightstar ,the leader), Jennifer (Tayln,who could fly and had a pet falcon) and Joshua (the younger brother, now known as Grimskull due to being turned into a half- skeleton humanoid for his help in dividing the crystal. Grimskull, who can "shadow slide"or teleport great distances, must deal with the evil that tries to devour his soul. He was kind of the line's answer to Wolverine or Snake Eyes) Their uncle, Ursak The Guardian (The Team's Weapons Expert), was a 90's version of Man At Arms of the He-Man line. The skeletons were lead by Baron Dark, who wears human skulls like medals across his shoulders) . Shriek (originally going to be called Banshee) was the female skeleton whose scream could shatter objects. Dagger was a short skeleton with one eye and a huge axe (but his name is Dagger?) and Aracula a sort of six armed spider/skeleton hybrid. Dr. Cyborn was a half skeleton/half robot who was Baron Dark's scientific expert and high tech weapon maker. The detail these figures (especially the skeletons ) is outstanding. Each figure had unique, highly-detailed weapons, one weapon which could be fired by spring loading. Many of them had gold chrome plating on their armor and the skeletons had shiny cold eyes which added to their fearsome look. Figures for both sides had a plastic crystal somewhere on their outfit which was available in an assortment of colors. There are no color variations that are scarce or hard to find. The bad guys were the first that were provided with vehicles. Baron Dark had a skeleton horse and a Skull Cycle for his minions to ride. There was also a 3-D video game ,a cartoon on Saturdays and several other tie-ins made for the line. One of the action figure collecting magazines, Action Figure News and Toy Review, even did a college like thesis on why it would succeed. The line had retail support and it all seemed poised to be the next super-line. But the line was cancelled after just one year. Why did this line fail? I feel there are many reasons. First, Playmates, obviously very impressed with the detail on the skeleton figures, made a mistake of releasing all the bad guys first and not releasing the good guys until in the late summer. By that time, they were reduced for clearance. It is widely felt in the toy industry that villains never sell as well as heroes in action figure lines, that's why we got all those Batman variations. Another reason is that a little line called Power Rangers was still sought after by kids while the show was peaking in popularity. The Skeleton Warriors cartoons got moved around frequently which made it hard to establish a following, but the main reason it failed may have been the figures and the story plot were too dark for children. With a bunch of skeleton and skull images blazing on the packages (and on the good guys as well), concerned parents did not want to buy their kids toys which seemed steeped in death and evil. Remember, this was the first year of the Spawn line, whose later figures were horrific, but later was very tame looking in it's first year compared to the figures from Skeleton Warriors. I think it is safe to say that the line a little before their time. If they had been released in the current market they would've done great. Also, the color scheme on the bad guys was very dull and plain compared to the colorful Power Rangers, which parents felt were less harmful for junior. When retail interest waned and CBS did not order any more cartoons, the toy world cancelled their reservation to see any more battles with the Legion of Light and the Skeleton Legion. The most tragic part of the cancellation was the promise of the prototypes shown for what was to be the 95 season, were never to be made. We would've seen more highly detailed villains, such a Bonezai (samurai skeleton), Sting (a 2 headed scorpion/skeleton hybrid), Claw, and a skeleton who wore Viking battle gear. The first 5 skeletons were also to be released in brighter colors (to compete with Power Rangers) and feature a break-apart feature. A horse and skycycle for the Heroes never got made and all we were left with were the bad guy's accessories. A huge and incredible looking bone dragon for the bad guys to ride was never made, nor was a proposed castle with a huge skull design to it, shades of Castle Greyskull). But, the saddest of these losses, was the figure of heroine - Talyn. She was made for the first season but was pushed back for retooling and eventually ended up not being made at all. If they had put her out during the first season, like they planned, I believe that she would've saved the line. Shriek may have been a woman but she was no lady! The figures were available for as recently as 2000 at KB outlets for the price of three for 10.00 dollars. None of them are very hard to get but the heroes are a bit harder to find then the skeletons. Such was Skeleton Warriors. Despite all of the research done by companies, identifying what will top kid's wishlists is really a guessing game. Skeleton Warriors were an incredible line which had the potential to become toy legend, but will now be remembered as just another fatality in the never ending battle between toymakers to create the next big thing.